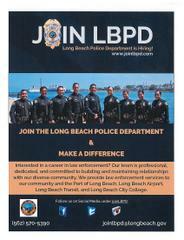 Interested in a career in law enforcement? Our team is professional, dedicated, and committed to building and maintaining relationships with our diverse community. We provide law enforcement services to our community and the Port of Long Beach, Long Beach Airport, Long Beach Transit, and Long Beach City College.